Note: Rhinestone or Pearl may fall off, so there are require buyer to maintain that, so please consider that before you buy it. 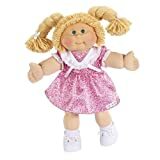 The official Cabbage Patch Kids Vintage Dolls are here! These 16 inch Classic Cabbage Patch Kids brings you back to 1983 and all the Hype! Nostaigic, yet trendy, cuddly and nurturing. The Only Cabbage Patch Kid on the market with Yarn Hair Iconic Window Box Packaging. Color/Style selected randomly by warehouse at time of shipment based on availability. The official Cabbage Patch Kids Vintage Dolls are here! These 16 inch Classic Cabbage Patch Kids brings you back to 1983 and all the Hype! Nostaigic, yet trendy, cuddly and nurturing. The Only Cabbage Patch Kid on the market with Yarn Hair Iconic Window Box Packaging. Color/Style selected randomly by warehouse at time of shipment based on availability.